Having noted that a building must have a system to resist both lateral bending and shear in addition to the ever-present gravity loads, let us take a trip around the world to explore how prominent engineers have exploited this concept. Although some of the case studies include run-of-the-mill designs that a large number of engineers solve on a day-to-day basis, others are once-in-a-lifetime high-profile projects, even daring in their engineering solutions. Many are examples of buildings constructed or proposed in seismically inactive regions, requiring careful examination of their ductile behavior and reserve strength capacity before they are applied in seismically active regions. The main purpose of this section is to introduce the reader to various structural systems normally considered in the design of tall buildings. Presently it will be seen that design trend is toward using composite systems that include such components as megaframes, interior and exterior super-braced frames, spine structures, etc. The case studies highlight those aspects of conceptualization that are timeless constants of the design process and are as important for understanding structural design as is the latest computer software. The case histories are based on information contained in various technical publications and periodicals. Frequent use is made of personal information obtained from structural engineers-of-record. Figure 8.4. Empire State Building bracing system; riveted structural steel frame encased in cinder concrete. exceeded its 1280-ft (381-m) height by almost 120 ft (37 m). The structural steel frame consisting of moment and braced frames with riveted joints, although encased in cinder concrete, was designed to carry 100% of the gravity and wind loads. The concrete encasement, although neglected in strength analysis, stiffened the frame considerably against wind loads. Measured frequencies of the building have estimated the actual stiffness at 4.8 times the stiffness of the bare frame. A schematic elevation of the structural framing is shown in Fig. 8.4. This is a 52-story steel-framed office building that rises to a height of 623 ft (190 m) above the street level. 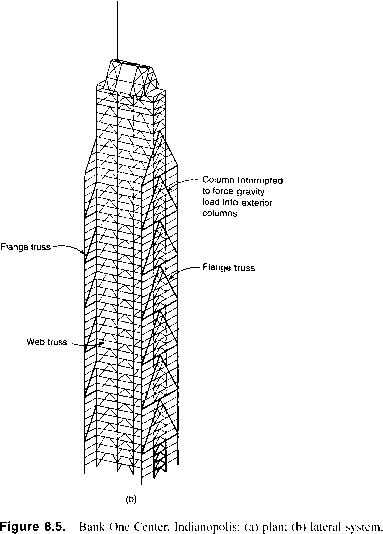 In plan, the tower is typically 190 x 120 ft (58 x 37m) with set-backs at the 10th, 15th, 23rd, 45th, and 47th floors (Fig. 8.5). the two to a minimum. 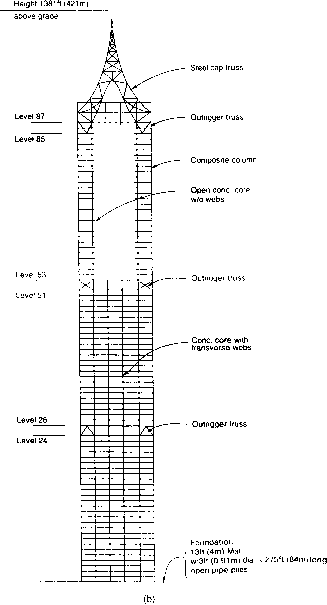 To assure a direct load path for the transfer of gravity load from the core to the truss columns, a core column is removed below the level of braces at every 12th level, as shown in Fig. 8.5b. In addition, the step-back corners are cantilevered to maximize the tributary area of gravity load and thus compensate for the tensile force due to overturning moments. The structural design is by LeMessurier Consultants, Inc., Cambridge, MA. This 28-story office building, shown in Fig. 8.6, has a four-level subterranean structure that will serve as a common base for the MTA Tower and two future office buildings. The basement extends beyond the footprint of the tower and consists of precast reinforced concrete columns and girders with a cast-in-place concrete slab. Figure 8.6. 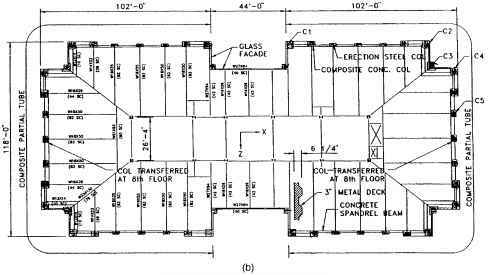 MTA headquarters, Los Angeles: (a) building elevation; (b) typical floor framing plan. Architects: McLarand Vasquez & Partners, Inc.; Structural engineers: John A. Martin & Associates, Inc., Los Angeles. The plaza underneath the tower consists of a composite floor system with a 4 Jr-in. (114-mm) normal-weight concrete topping on a 3-in. (76-mm)-deep, 18-gauge composite metal deck. The metal deck spans between composite steel beams spaced typically at 7 ft 6 in. (2.29 m) outside the tower, which has a heavy landscape. The beam spacing is at 10 ft (3.04 m) on centers within the tower footprint. 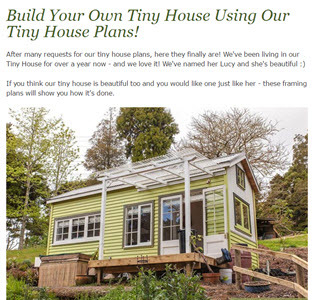 The building is essentially rectangular in plan, 118 x 165 ft (36 x 50.3 m) with a slight radius on the short faces. The height is 400 ft (122 m), resulting in a fairly low height-to-width ratio of 3.39. Typical floor framing consists of 21-in. (0.54-m)-deep composite beams spanning 41 ft (12.5 m) from the core to the exterior. A 3-in. (76-mm)-deep metal deck with a 3|-in. (83-mm)-thick lightweight concrete topping completes the floor system. See Fig. 8.6b. The lateral system consists of a perimeter tube with widely spaced columns tied together with spandrel beams. The exterior columns on the broad faces vary from W30 x 526 at the plaza to W30 x 261 at the top. The spandrels vary from WTM36 x 286 at the plaza level to W36 x 170 at the top floors. The columns on the curvilinear faces are built-up, 34 x 16-in. (0.87 x 0.40-m) box columns while 24 x 24-in. (0.61 x 0.61-m) box columns are used at the corners. Plates varying in thickness from 4 in. (102 mm) at the bottom to 1 in. (25 mm) at the top are used for the built-up columns. The architecture for the building is by McLarand Vasquez and Partners, Inc., while the structural engineering is by John A. Martin and Associates, Inc., both of Los Angeles, CA. Figure 8.7. 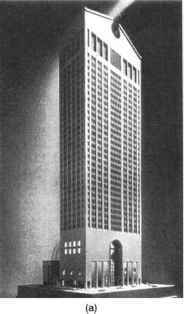 South Walker Tower, Chicago; schematic plans. overall. The building steps back at the 15th floor on three faces to provide ten corner offices on each floor. There are additional setbacks at the 47th floor. At the 51st floor, the sawtooth shape is dropped and the tower becomes an octagon in plan with 70-ft (21.4-m)-long sides. The slenderness ratio of the structures is 7.25:1. 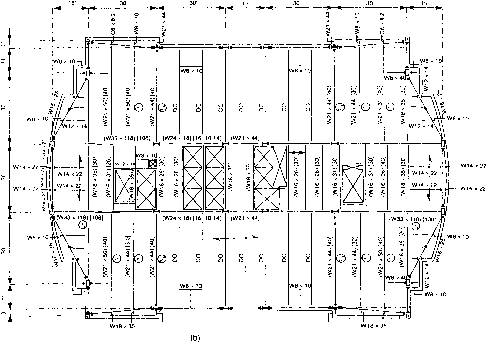 The schematic floor plans at various levels are shown in Fig. 8.7. The core shear walls in the tower's lower floors carry much of the lateral loading with shear wall-frame interaction. There are four main shear walls—two I-shapes and two C-shapes—on a typical floor. These interact with the perimeter columns and perimeter spandrel beams through girders that span from core to the perimeter. The girders have 39-in. (1.0-m)-deep haunches at the columns. Spandrels are 36 in. (0.92 m) deep. Core wall concrete design strength varies from 8000 psi (55.12 mPa) at the base to 4000 psi (27.6 mPa) at the upper levels. There is a 40- to 48-ft (12.2- to 14.63-m) span between the core and the perimeter. The spacing between the perimeter columns is fairly short, about 14 ft (4.3 m), except at two corners where the spacing is 32 ft (9.76 m). Column loads range from 12,000 to 30,000 kips (53,376 to 133,440 kN). Concrete strengths range from 12,000 to 4000 psi (82.74 to 27.58 mPa). Figure 8.8. 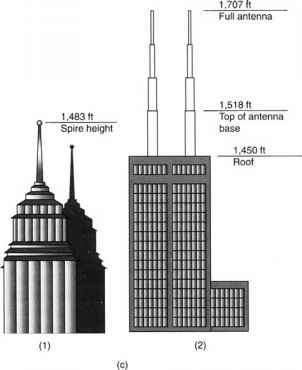 AT&T Building, New York: (a) building elevation; (b) lateral system. Perimeter steel tube interacts with interior braces. Steel plate outriggers interconnect the tube and braces. The largest columns, which are 5 x 5 ft contain 52 #18, grade 75 rebars. 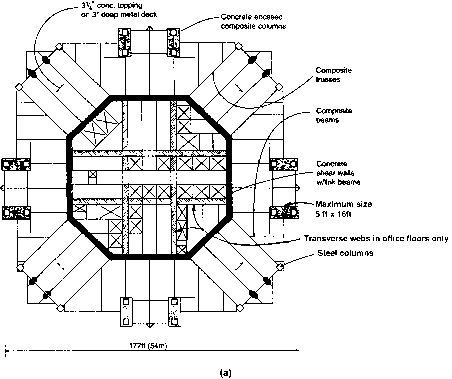 The original design for the floor system had 16-in. (406.4-mm)-deep spans with 4-in. (101.6-mm)-thick slabs. This was changed to a post-tensioned system with a 10-in. (254 mm)-deep joist and a 4.5-in.-thick slab. Structural design is by Brockette, Davis, Drake, Inc., Dallas, TX. The basic lateral-force-resisting structural system for the building shown in Fig. 8.8 consists of a rigid-frame steel tube at the building perimeter. Additional stiffness is added along the width of the building by means of four vertical steel trusses. At every eighth floor, two I-shaped steel plate walls, with holes cut for circulation, extend from the sides of the trusses to the exterior columns on the same column line. The steel walls act as outrigger trusses mobilizing the full width of the building in resisting lateral forces. The horizontal shear at the base of the building is transferred to two giant steel plate boxes (Fig. 8.8). Structural design is by Leslie Robertson and Associates, New York. The proposed Miglin-Beitler Tower, designed by the New York Office of Thornton- Tomasetti Engineers, will rise to the height of 1486.5 ft (453 m) at the upper skyroom level, 1584.5 ft (483 m) at the top of the mechanical areas, and finally to 1999.9 ft (609.7 m) at the tip of the spire. An elevation and the schematic plan of the proposed building are shown in Fig. 8.9. The structural system consists of five major components as shown in Fig 8.9c. 1. A 62 ft-6 in. x 62 ft-6 in. (19 x 19 m) concrete core with walls varying from a maximum thickness of 3 ft. (0.91 m) to a minimum thickness of 1 ft-6 in. (0.46 m). 2. 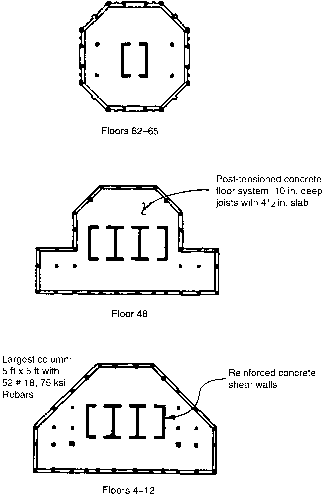 A conventional structural steel composite floor system consisting of 18-in. (0.46-m) deep-rolled steel sections spaced 10 ft (3.05 m) on center with 3-in. (74-mm)-deep corrugated metal deck and a 3 34-in. (89-mm)-thick normal-weight concrete topping. The steel floor system is supported on light steel erection columns that allow the steel construction to proceed 8 to 10 floors ahead of concrete operation. 3. Concrete fin columns, each of which encases a pair of steel erection columns located at the face of the building. These fin columns, which extend 20 ft (6.10 m) beyond the 140 x 140-ft (42.7 x 42.7-m) footprint of the building, vary in dimension from 6)2 x 33 ft (2.0 x 10 m) at the base, 5)2 x 15 ft (1.68 x 4.6 m) at the middle, to 4>2 x 13 ft (1.38 x 4 m) near the top. 4. Concrete link beams that interconnect the four corners of the core to the eight fin columns at every floor. These beams tie the fin columns to the core, thus engaging the full structural width of the building to resist lateral loads. In addition to the link beams at each floor, there are three two-story-deep outrigger walls located at the 16th, 56th, and 91st stories. These outrigger walls further enhance the structural rigidity by linking the exterior fin columns to the concrete core. 5. Exterior vierendeel trusses comprising a horizontal spandrel and two columns at each of the 60-ft (18.3-m) faces on the four sides of the building. These vierendeels supplement the lateral force resistance and also improve the torsional resistance of the structural system. Additionally, these trusses transfer gravity loads to the exterior fin columns, thus minimizing uplift forces. Figure 8.9. 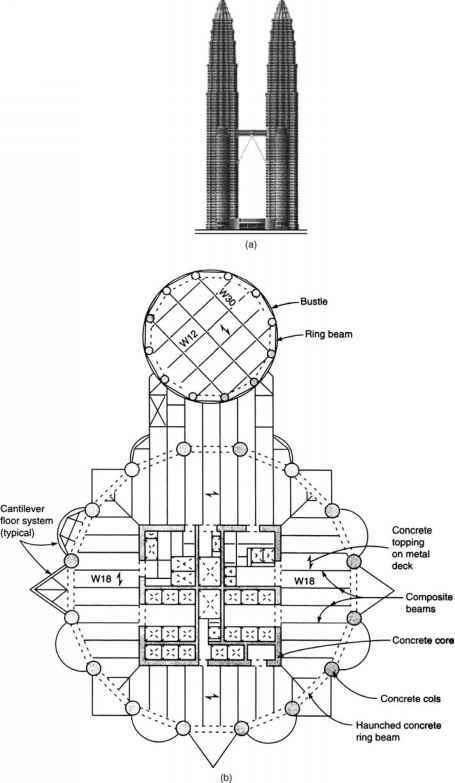 Miglin-Beitler Tower, Chicago: (a) elevation; (b) plan; (c) typical floor framing plan. edge of the mat and on the projected side surface of the caisson will provide additional resistance to shear at the base. This is a 45-story office tower with a clear 45-ft-6-in. (13.87-m) span between the core and the exterior (Fig. 8.10). The structural system consists of eight composite concrete columns measuring 7 ft-6 in. x 4 ft-9 in. 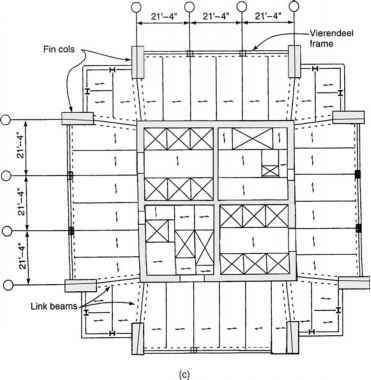 (2.28 x 1.45 m) at the base, placed 20 ft (6.1 m) away from the corners to provide column-free corner offices and also to optimize the freespan of the vierendeel frames. 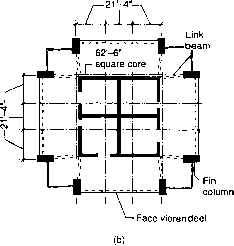 The composite columns are connected at each face by a system of perimeter columns and spandrels acting as vierendeel frames. The vierendeels are stacked four stories high and span between composite supercolumns to provide column-free entrances at the base of the tower. At each fourth level, the vierendeels are linked by hinges to transfer only horizontal shear between adjoining vierendeels and not gravity loads. The reason for this type of connection is to reduce: 1) the effect of creep and shrinkage of supercolumns on the members and connections of the vierendeel, and 2) gravity load transfer due to arch action of the vierendeel with associated horizontal thrusts. The four-story vierendeel achieves uniformity in the transfer of moment and shear between horizontal steel beams and composite supercolumns throughout the height of the tower. A schematic representation of the structural system is shown in Fig. 8.10a-d. Figure 8.10d shows the connection details for the vierendeel frame. The structural design is by CBM Engineers, Inc., Houston, TX. Figure 8.10. One Detroit Center: (a) building elevation; (b) typical floor framing plan; (c) free-spanning vierendeel elevations; (d) structural details for vierendeel frame, (1) partial elevation, (2) detail 1, (3) detail 2. This building consists of a 1381-ft (421-m) tower and an attached low-rise podium for a total gross building area of approximately 3 million sq ft (278,682 m2). 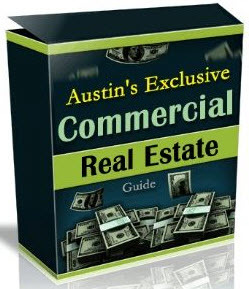 The building includes 50 stories of office space topped by 36 stories of hotel space with two additional floors for a restaurant and an observation deck. Parking for automobiles and bicycles is located below grade. The podium consists a retail spaces as well as an auditorium and exposition spaces. 5 x 16 ft (1.5 x 4.88 m) with a concrete strength of 7500 psi (51.71 mPa) at the foundation to 3 x 11 ft (0.91 x 3.53 m) with a concrete strength of 5000 psi (34.5 mPa) at level 87. The shear-wall core is directly linked to the exterior composite megacolumns by structural steel outrigger trusses. The outrigger trusses resist lateral loads by maximizing the effective depth of the structure. Under bending, the building acts as a vertical cantilever with tension in the windward columns and compression in the leeward columns. Gravity load framing minimizes uplift in the exterior composite megacolumns. The octagon-shaped core provides exceptional torsional resistance, eliminating the need for any exterior belt or frame systems to interconnect exterior columns. The outrigger trusses are located between levels 24 and 26, 51 and 53, and 85 and 87. The outrigger truss system between levels 85 and 87 is capped with a three-dimensional steel space that which provides for the transfer of lateral loads between the core and the exterior composite columns. It also supports gravity loads of heavy mechanical spaces located in the penthouse floors. The structural elements for resisting gravity loads include eight structural steel built-up columns. Composite wide-flange beams and trusses are used to frame the floors. The floor-framing elements are typically 14 ft 6 in. (4.4 m) on center with a composite 3-in. (7.6-cm)-deep metal deck and a 3^-in. (8.25-cm)-thick normal-weight concrete topping slab spanning between the steel members. The foundation system for the Tower consists of high-capacity piles capped with a reinforced concrete mat. High-water conditions required the use of a 3 ft-3 in. (1-m)-thick, 100-ft (30-m)-deep, continuous reinforced concrete slurry wall diaphragm along the 0.5-mile (805-m) perimeter of the site. The high-capacity pile system consists of a 3-ft (0.91-m)-diameter structural steel open-pipe pile with a 78 -in. (2.22-cm)-thick wall typically spaced 9 ft (2.75 m) on center capped by a 13-ft (4-m)-deep reinforced concrete mat. Since soil conditions at the upper strata are so poor, the piles were driven into a deep, stiff sand layer located approximately 275 ft (84 m) below grade. The individual design-pile capacity is 1650 kips (7340 kN). 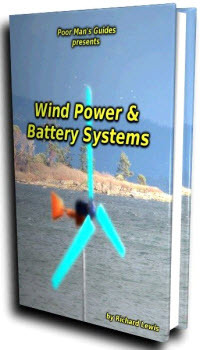 Strength design of the structure is based on a 100-year wind with a basic wind speed of 75 mph for a 10-min average time. The wind speed corresponds to a design wind pressure of approximately 14 psf (0.67 kN/m2) at the bottom of the building and 74 psf (3.55 kN/m2) at the top of the spire. Exterior wall-design pressures are in excess of 100 psf (4.8 kN/m2) at the top of the building. which two tall structures are proposed adjacent to the Jin Mao Building. The drift index based on specific Chinese code-defined winds, which were equivalent to a 3000-year wind, is 1/575. The structural design for the tower is governed by its dynamic behavior under wind and not by its strength or its overall or interstory drift. The calculated fundamental translational periods are 5.7 sec. for each principal axis. The torsional period is 2.5 sec. 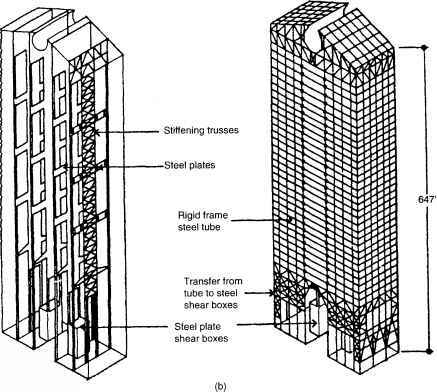 In a force-balance and aeroelastic wind-tunnel study, the accelerations at the top floors were evaluated using a value of 1.5% for structural damping. The accelerations measured in the wind tunnel were between 9 and 13 milli-g's for a 10-year return period, and between 3 and 5 milli-g's for a one-year return period—well within the generally accepted range of 20 to 25 milli-g's for a 10-year return. Only the passive characteristics of the structural system including its inherent mass, stiffness, and damping are required to control the dynamic behavior. Therefore, no mechanical damping systems are used. Since the central core and composite megacolumns are interconnected by outrigger trusses at only three 2-story levels, the stresses in the trusses due to differential shortening of the core relative to the composite columns were of concern. Therefore, concrete stress levels in the core and megacolumns were controlled in an attempt to reduce relative movements. To further reduce the adverse effect of differential shortening, slotted connections were used in the trusses during the construction period of the building. Final bolting with hard connections was done after completion of construction to relieve the effect of differential shortening occurring during construction. The architecture and structural engineering of the building is by the Chicago office of Skidmore, Owings, and Merrill. Figure 8.11. 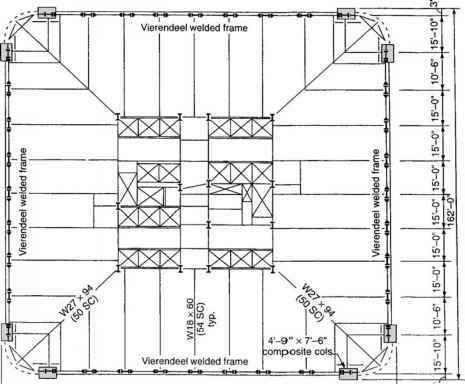 Jin Mao Tower, Shanghai, China: (a) typical office floor framing plan. 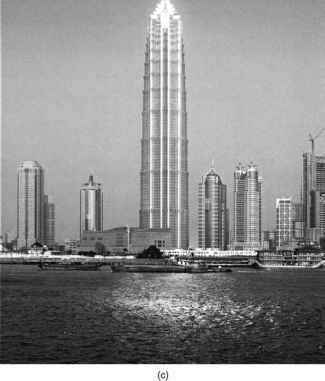 Two 1476-ft (450-m) towers, 33 ft (7 m) taller than Chicago's Sears Tower, and a sky bridge connecting the twin towers characterize the buildings in Kuala Lumpur, Malaysia (Fig. 8.12). The towers have 88 numbered levels but are in fact equal to 95 stories when mezzanines and extra-tall floors are considered. In addition to 6,027,800 ft2 (560,000 m2) of office space, the project includes 1,501,000 ft2 (140,000 m2) of retail and entertainment space in a six-story structure linking the base of the towers, plus parking for 7000 vehicles in five below-ground levels. The lateral system for the towers is of reinforced concrete consisting of a central core, perimeter columns, and ring beams using concrete strengths up to 11,600 psi (80 mPa). The foundation system consists of pile and friction barrette foundations with a foundation mat. The typical floor system consists of wide-flange beams spanning from the core to the ring beams. A 2-in.-deep composite metal deck system with a 4V4-in. (110-mm) concrete topping completes the floor system. Architecturally, the towers are cylinders 152 ft (46.2 in) in diameter formed by 16 columns. The facade between columns has pointed projections alternating with arcs, giving unobstructed views through glass and metal curtain walls on all sides. The floor plate geometry is composed of two rotated and superimposed squares overlaid with a ring of small circles. The towers have setbacks at levels 60, 72, 82, 85, and 88 and circular appendages at level 44. Concrete perimeter framing is used up to level 84. Above this level, steel columns and ring beams support the last few floors and a pointed pinnacle. Figure 8.11. 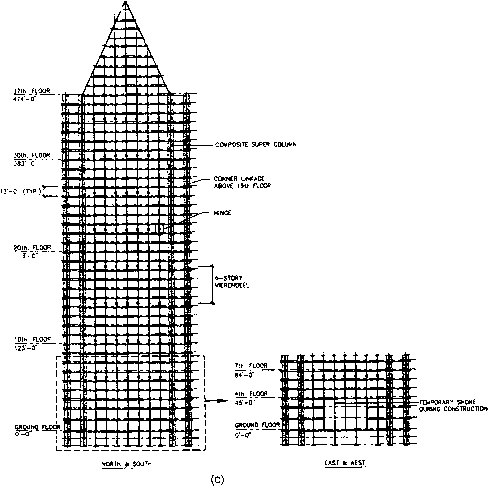 Jin Mao Tower, Shanghai, China: (b) structural system elevation. The towers are slender with an aspect ratio of 8.64 (calculated to level 88). The design wind speed in Kuala Lumpur area is based on 65-mph (35.1-m/s) peak, 3-sec gusts at 33 ft (10 m) above grade for a 50-year return. In terms of the old U.S. standard of fastest mile wind, the corresponding wind speed is about 52 mph (28.1 m/s). The mass and stiffness of concrete are taken advantage of in resisting lateral loads, whereas the advantages of speed of erection and long-span capability of structural steel are used in the floor framing system. The building density is about 18 lb/cu ft (290 kg/m3). period acceleration is in the range of 20 mg, within the normally accepted criterion of 25 mg. The periods for the primary lateral modes are about 9 sec, while the torsional mode has a period of about 6 sec. The drift index for lateral displacement is of the order of 1/560. Because the limestone bedrock lies 200 ft (60 m) to more than 330 ft (100 m) below dense salty sand formation, it was not feasible to extend the foundations to bedrock. 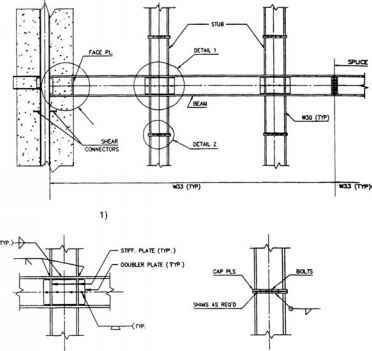 A system of drilled friction piers was designed for the foundation, but barrettes (slurry-wall concrete segments) proposed as an alternative system by the contractor were installed. A 14.8-ft (4.5-m)-thick mat supports the 16 tower columns and 12 bustle columns. The floor corners of alternating right angles and arcs are cantilevered from the perimeter ring beams. Haunched ring beams varying from 46 in. (1.17 m) deep at columns to 31 in. (0.78 m) at midspan are used to allow for ductwork in office space outside of the ring beams. A similar approach with a midspan depth of 31 in. (0.78 m) is used in the bustles. The haunches are used primarily to increase the stiffness of the ring beams. The central core for each tower houses elevators, exit stairs, and mechanical services, while the bustles have solid walls. The core and bustle walls carry about half the overturning moment at the foundation level. Each core is 75-ft (23-m) square at the base, rising in four steps to 62 x 72 ft (18.8 x 22 m). Inner walls are a constant 14 in. (350 mm) thick while outer walls vary from 30 to 14 in. (750 to 350 mm). The concrete strength varies from 11,600 to 5800 psi (80 to 40 mPa). Figure 8.12. 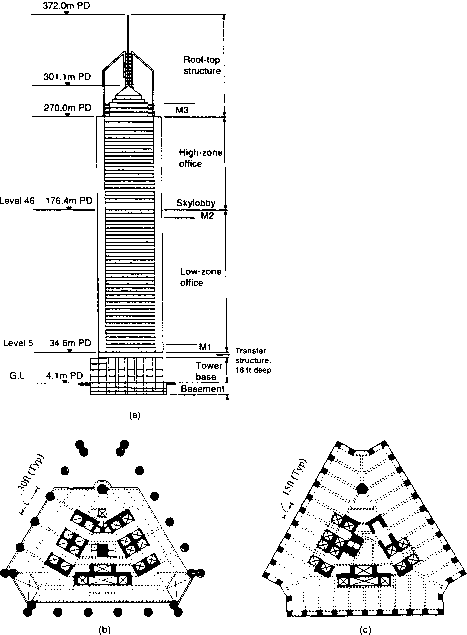 Petronas Twin Towers, Kuala Lumpur, Malaysia: (a) elevation; (b) structural system plan. Figure 8.12. Height comparison: (1) Petronas Towers; (2) Sears Tower, Chicago. To increase the efficiency of the lateral system, the interior core and exterior frame are tied together by a two-story-deep outrigger truss at the mechanical equipment room (level 38). A vierendeel type of truss with three levels of relatively shallow beams connected by a midpoint column is used to give flexibility in planning of building occupancy. The tower floors, Fig. 8.12b, typically consist of composite metal deck with concrete topping varying from 41/2 in. (110 mm) in offices to 8 in. (200 mm) on mechanical floors, including a 2-in. (53-mm)-deep composite metal deck. Wide-flange beams frame the floors at spans up to 42 ft (12.8 m), and are W18 or shallower on most floors to provide room for ductwork, sprinklers, and lights. Cantilevers for the points beyond the ring beams are 3.28-ft (1-m)-deep prefabricated steel trusses. For the arcs, the cantilevers are beams propped with kickers back to the columns. Trusses and beams are connected to tower columns by embedded high-strength bolts. The structural engineering is by Thornton-Tomasetti Engineers, and Ranhill Bersekutu Sdn. Bhd. 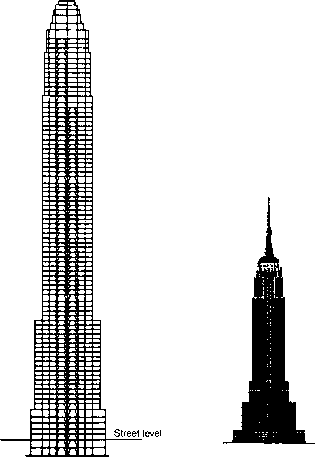 Although the Sears Tower's 110 stories dwarf the Malaysian twin skyscrapers' 88 floors (Fig. 8.12c), an engineering panel from the Council on Tall Buildings and Urban Habitat says that the Sears Tower is no longer the world's tallest building. This panel, which sets international building height standards, contends that the Petronas Towers' 242-foot-high ornamental spires are part of their height while the radio antennas of the Sears Tower are not. This is because traditionally the measurement from ground-floor entrance to the highest original structural point has been the criterion for assessing the height of skyscrapers for over a quarter of a century. Executives of the Chicago skyscrapers disagree, and say their building is actually 35 feet taller if the radio bases are considered as part of the height. The building has 78 stories, with the highest office floor at 879 ft (268 m) above ground. Including the tower mast, the building is 1207.50 ft (368 m) tall (Fig. 8.13a). The building has a triangular floor plate with a sky lobby on the 46th floor. The triangular design consisting of a typical floor area of 23,830 ft2 (2214 m2), (Fig. 8.13b,c) was preferred over a more traditional square or rectangular plan because the triangular shape has very few dead corners and offers more views from the building interiors. Figure 8.13. Central Plaza, Hong Kong: (a) elevation; (b, c) floor plans. The tower consists of three sections: 1) a 100-ft (30.5-m)-tall tower base forming the main entrance and public circulation spaces; 2) a 772.3-ft (235.4-m)-tall tower section containing 57 office floors, a sky lobby, and five mechanical floors; and 3) a top section consisting of six mechanical floors and a 334-ft (102-m)-tall tower mast. The triangular building shape is not truly triangular because its three corners are chamfered to provide better internal office layout. The building facade is clad in insulated glass. The mast is constructed of structural steel tubes with diameters up to 6.1 ft (2 m). The triangular core design provides a consistent structural and building services configuration. A column-free office space, with 30.84- to 44.3-ft (9.4- to 13.5-m) depth is provided between the core and the building perimeter. To enhance the spatial quality of the tower at the base, the 15-ft (4.6-m) column grid of the tower is transformed to a 30-ft (9.2-m) column grid by eliminating every other column. An 18-ft (5.5-m)-deep transfer girder facilitates column termination. The building site is typical of a recently reclaimed area in Hong Kong with sound bedrock lying between 82 and 132 ft (25 and 40 m) below ground level. This is overlaid by decomposed rock and marine deposits with the top 33 to 50 ft (10 to 15 m) consisting of a fill material. The allowable bearing pressure on sound rock is of the order of 480 ton/ft2 (5.0 kN/m2). The maximum water table is about 6.1 ft (2 m) below ground level. Wind loading is the major lateral load criterion in Hong Kong, which is situated in an area subject to typhoon winds. The local wind design is based on a mean hourly wind speed of 100 mph (44.7 m/s), corresponding to a 3-sec gust of 158 mph (70.5 m/s). The resulting lateral design pressure is 86 psf (4.1 kN/m2) at 656 ft (200 m) above ground level. 1. Simultaneous construction of superstructure and basement, thus reducing the time required for construction. 2. Use of basement floor slabs for bracing of diaphragm walls, thereby reducing lateral tiebacks. 3. 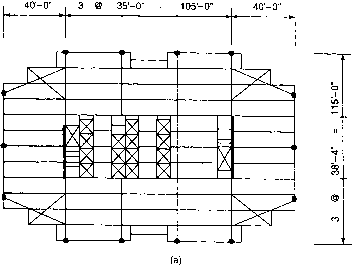 Construction of a watertight box within the site enabling installation of hand-dug caissons, traditional in some countries outside of North America. The lateral system for the tower above the transfer girder consists of external facade frames acting as a tube. These consist of closely spaced 4.93-ft (1.5-m)-wide columns at 15-ft (4.6-m) centers and 3.6-ft (1.1-m)-deep spandrel beams. The floor-to-floor height is 11.82 ft (3.6 m). The core shear walls carry approximately 10% of the lateral load above the transfer level. The transfer girder located at the perimeter is 18 ft. (5.5 m) deep by 9.2 ft (2.8 m) wide. The increased column spacing, together with the elimination of spandrel beams in the tower base, results in the external frame no longer being able to carry the entire lateral load acting on the building. Therefore, the wind shears are transferred to the core through the diaphragm action of a 3.28-ft (1-m)-thick slab located at the transfer level. Structural engineering for the project is by Ove Arup and Partners. Figure 8.14. One-Ninety-One Peachtree, Atlanta: (a) building elevation; (b) typical floor framing plan. concrete spandrels. The building interior is an all-steel structure with composite steel beams supported on steel columns (Fig. 8.14b). Since the building did not achieve the lateral resistance until after the concrete had reached a substantial strength, a system of temporary bracing was provided in the core. The erected steel was allowed to proceed 12 floors above the completed composite frame with six floors of metal deck and six floors of concreted floors. The structural design is by CBM Engineers, Inc., Houston TX. The 57-story office building has a square plan with the corners serrated to create the desired architectural appearance and to provide for more corner offices (Fig. 8.15). The typical floor plan (Fig. 8.15b) is 162 x 162-ft (49.87 x 49.87 m) with an interior core measuring 58 ft-8 in. x 66 ft-8 in. (17.89 x 20.32 m). A five-level basement provided below the tower is of reinforced concrete construction. The foundation consists of shallow drilled piers bearing on rock. The gravity load is primarily supported by 12 composite supercolumns. Four of these are located at the corner of the core, and eight at the perimeter, as shown in Fig. 8.15b.